To some it looks like a small castle, very similar to the corner rook piece on a chessboard. To me it was the center of my stomping grounds in the old North Ward. I'm talking about the water tower on Bloomfield Avenue, right across from Dickey Dee's Italian hot dog and pizza emporium, and Calandra's Bakery-right there where Bloomfield Avenue, 6th Street and First Avenue nestle together. It's diagonally across from the old Coca Cola bottling plant. In the other direction across the avenue is where our old family friend Nick Gianotto had his pharmacy for over 40 years. On 4th and 5th streets is where our family raised its battle flag. Just a block or two down the road was Ting-a-Ling's and Branch Brook Park. I can still smell Tom's Pork Store when it was there on the corner of 6th Street. Sometimes, I just walked in to inhale; and across the street another long-time inhabitant of the Avenue, Tower Photo Studio...home of your communion and confirmation pictures, and maybe some bronzed baby shoes and pictures. The tower goes way back to when Newark first imagined a new source of water for its rapidly expanding city, and in 1895 built two huge 60 inch water mains that extended down from the Newark watershed up along old Route 23 in Pequannock. The tower is a central nexus point for that soft, tasty water that made Newark's one-time seven breweries famous. 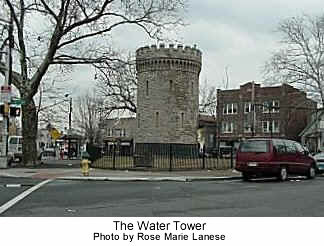 The water tower is the metering point for the incoming water, and from it radiate 30 inch mains throughout Newark and one over to the old Belleville reservoir (on Joralemon Avenue). All these pipes form part of the complex and massive North Jersey water system. Only the monstrous 72 inch water mains that emanate from the Boonton Reservoir feeding Jersey City out-do Newark's 60 inch twins. All these pipes and many others interconnect and keep us Jersey folks clean and thirst-free. Only once did I see the huge pipes exposed, back in the early 1960s when the street was dug down to perform some re-arrangement work just outside the tower. Several times while passing I thought I caught a whiff of sulfur and brimstone. A man could easily lose his identity among those massive, riveted, cold steel tubes. I can only imagine the huge undertaking it must have been to build the original route, with eager manpower from Newark's burgeoning immigrant population fueling the massive project. I remember talking to an old-timer who worked on the Newark infrastructure from the water mains to the rail yards. He was the father of the landlord who lived upstairs from me when I had my bachelor pad over on Elwood Avenue. As he smoked his Prince Albert tobacco in a well-seasoned, lovingly sweetened pipe, Rocco told me in broken English how he lost the tip of his finger in a rail yard accident; and routinely worked with pick and shovel in 90 degree summer heat-that good old New Jersey muggy weather that makes out-of-staters gasp and wheeze. Only thing was, Rocco did it when there was no air conditioning to go home to. His Irish gang boss Mike, never worked the men more than 15 minutes at a time without a break when the muggy weather descended. When Rocco was young, parts of the North Ward and the Mt. Prospect Avenue area were still quite wide open, with working farms. Branch Brook Park wasn't built until 1904/05. My grandfather arrived here from Naples in 1906. Last time I saw Rocco was over 20 years ago, when he already was 95 years old. Every Sunday he would eat a pound of spaghetti, pieces of chicken, and several pork chops. Never did he go to sleep without reading the Bible. Rocco, you helped build this city.. and paisano, you did very good work.